The recently approved Community Benefits Agreement (CBA) for the 10 acres around the new Nashville soccer stadium includes some key provisions for worker and community protections including a $15.50 minimum wage, affordable housing, community investment, and the establishment of a Community Advisory Committee to oversee implementations of those provisions. And we celebrate these historic community gains for Nashville. However, for construction workers, the deal left out one major proposal that could mean the difference between life and death for Nashville area workers. Specifically, the final deal failed to provide for third-party worksite monitoring and concrete enforcement procedures to investigate, mediate and resolve potential violations of the agreed pieces of the CBA. Getting people on the job and boosting our economy are key first steps that have driven support for this stadium and related development. However, getting workers back home safely to their families should be of equal importance. The arrival of soccer in Nashville is a good thing. Everyone who participated in making the stadium CBA a reality should be applauded; but still there remains a real possibility that this shining moment for Nashville may be overshadowed by worker injury or death during construction. Across the globe, soccer stadium construction has been hugely controversial. Take for example the construction of soccer stadiums in Qatar in preparation for the 2022 World Cup where it has been reported that as many as 1,200 workers have been killed to date on construction sites – and that number is expected to reach 4,000 before the project is completed. According to the U.S. Department of Labor, 991 construction workers were killed on the job on U.S. worksites in 2016. Many of these deaths resulted from subpar training, faulty equipment, and lax safety standards on worksites. Many of these deaths occurred in the South, where low union density and a lack of work oversight and enforcement has had devastating consequences for workers and their families. In Tennessee alone, 40 workers were killed on worksites between April 2017 and May 2018. This agreement reasserts that workers on construction covered under this CBA  are OSHA10 certified and all foremen/supervisors OSHA30 certified. It also opened the door for the establishment of “high road contractor” criteria, which includes: direct employees, participates in a U.S. Department of Labor-certified apprenticeship program, and that provides ACA-compliant insurance or coverage to employees. 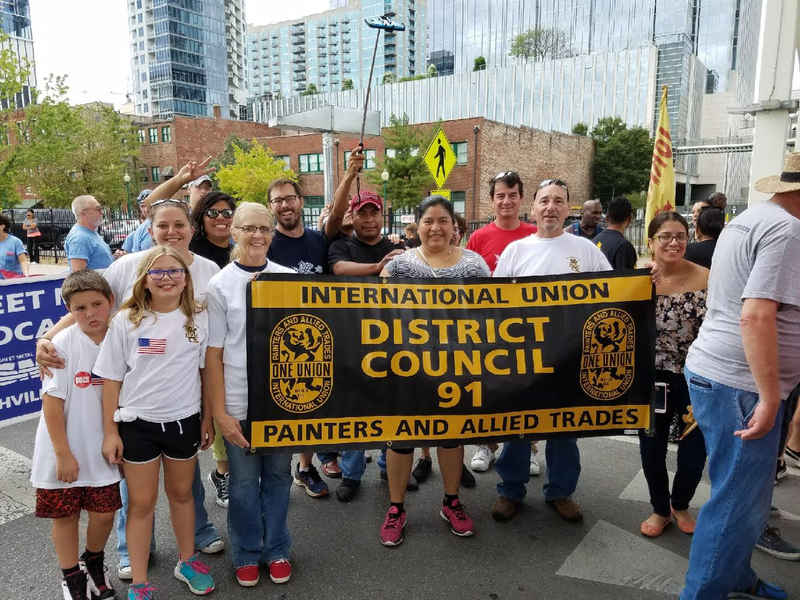 This underscores why we will continue to educate, organize and mobilize construction workers and their families to fight for more worker rights enforcement in Nashville, through legislation, through litigation and definitely through negotiations with developers. No matter how well-meaning corporations may be, we need concrete safeguards to protect workers, and there are no better advocates for these safeguards than workers themselves. As a community, we must demand every measure possible to ensure that every worker who steps onto a worksite returns home safely to their family at the end of the day. Enforcement is the only thing that takes any agreement from paper to the pavement. Workers deserve nothing less. Nashville deserves nothing less and it’s the right thing to do.